Sir Allama Muhammad Iqbal (Urdu: محمد اقبال ‬‎) (November 9, 1877 – Aprile 21, 1938), widely kent as Allama Iqbal (علامہ اقبال‬), was a poet, Philosopher, an politicion, as well as an academic, barrister a scholar in Breetish India wha is widely regairdit as haein inspired the Pakistan Muivement. He is cried the "Spiritual faither o Pakistan". He is conseedert ane o the maist important feegurs in Urdu leeteratur, wi leeterar wark in baith the Urdu an Persie leids. Allama Iqbal was born on 9th November at Sialkot, in 1877. His parents Noor Muhammad and Imam Bibi were pious and religious persons. He passed his matriculation and intermediate exams in 1893 and 1895 respectively. He did his B.A from Government College, Lahore in 1897 and M.A in philosophy in 1899. He took his Doctorate Degree from Munich (Germany). His thesis was "Philosophy Of Ajam". After talking his Barrister's Degree from London, In 1908; he returned home. After returning from England he started practice as a Barrister in 1908. The poet was born in him from early age. He wrote poetry under inspiration. He had written poetry in Urdu and Persian. Allama Iqbal has left valuable and voluminous treasures of Poetry and Prose after him. 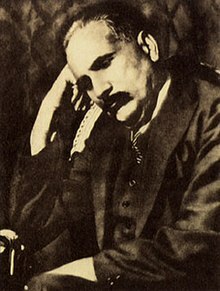 The following are famous poetic works of Iqbal: Israr Khudi (1915), Ramuz-e-Bekhudi (1918) Paigham-e-Mashriq (1923), Javed Nama (1932) and Musafir (1934) are his great works in Persian. Bange-e-Dira (1924) Bal-e-Jibrael (1935) and Zarb-e-Kaleem (1936) are famous collections in Urdu. The famous Prose collection of Iqbal's lectures is 'The Reconstruction Of Religious Thoughts In Islam'. Iqbal was a great mystic, a sufi. The poet of Khudi (I-am-ness) lived a very simple and contented life. His talks were full of wisdom and humor. He generally shunned poet's gatherings (Mushairas). He was indifferent to wealth and fame. Iqbal had good command on 'English, German and Arabic Languages'. He was greatly moved on seeing the down-troddenness and miserable condition of the Indian Muslims. He kept away from practical politics. But seeing the conditions of ummat-e-Muslaman, he came forward to serve them. He inspired them with his poetry. He was also elected to the Punjab Legislature in 1928. He attended round table confidences at London in 1931-32. It was Allama Iqbal who for the first time presented the idea of separate Home-Land (Pakistan) for the Indian Muslims. He was the originator of the two-nations theory. He was not only poet and great thinker but also a great moralist, a reformer and an educationist. Iqbal breathed his last on 21st april, 1938 and is buried in the compound of grand Badshahi Mosque, Lahore. ↑ Rehman, Javaid (2005). Islamic State Practices, International Law and the Threat from Terrorism: A Critique of the 'Clash of Civilizations' in the New World Order. Bloomsbury Publishingr. p. 15. ↑ 2.0 2.1 "Allama Muhammad Iqbal Philosopher, poet, and Political leader". Aml.Org.pk. Retrieved 2 March 2012. ↑ al. ], Albert M. Craig ... [et (2011). The heritage of world civilizations (9th ed.). Harlow: Pearson Education. p. 800. ISBN 9780205803477. This page wis last eeditit on 19 Julie 2018, at 10:35.